Posted by: Ash on December 22nd, 2015, in Guides. . Here is our selection of top tropical travel destinations worldwide, in no particular order, which includes countries, cities, towns, districts, islands, and certain protected areas. These are followed by the travel bloggers we have enjoyed who have written about their experiences and their own opinions of each destination. When viewed from Google maps, you can identify the Whitsundays region as the turquoise blue area on Queensland’s coastline. 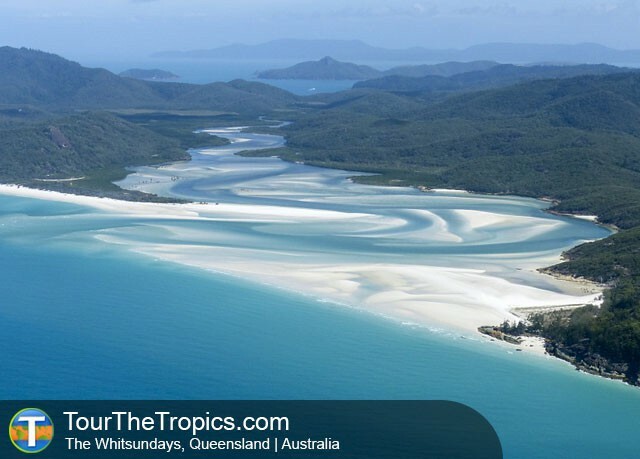 Straight away this shows why the Whitsundays are worth a visit. With exquisite blue waters, the Whitsundays is right in the middle of the World Heritage Listed Great Barrier Reef and home to 74 beautiful and mostly uninhabited islands with forests and walking tracks throughout. Enjoy the islands, cruise and snorkel the wildlife-filled waters to see sea turtles and colorful fish, relax on the beaches, and explore the national park. Some travel bloggers who explored the Whitsundays are the Merry Maker Sisters from Themerrymakersisters.com and Caz and Craig from Ytravelblog.com. As the Amazon Basin covers 40% of the South American continent and contains an incredible amount of biodiversity, we will break it down into two parts with a focus on the Amazon River & Amazon Rainforest. However, for a more indepth look you can see our Amazon Travel Guide. 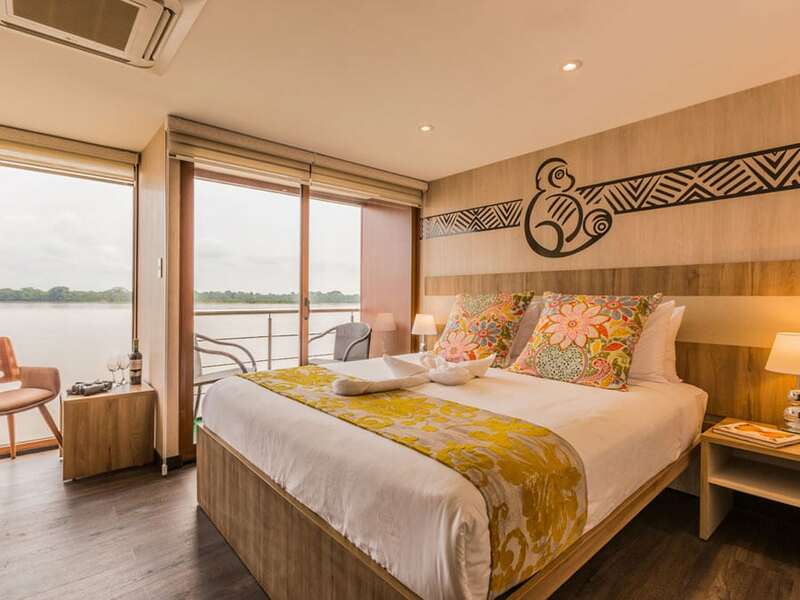 To experience the Amazon River and to enjoy forest wildlife at the edge of waterways, Iquitos in northern Peru provides one of the best places to take an Amazon cruise. Explore the incredibly diverse Pacaya Samiria National Reserve to see many different Amazon monkeys, toucans and other colorful birds, tamandua anteaters, delicate tree frogs, pink dolphins, orchids and bromeliads. 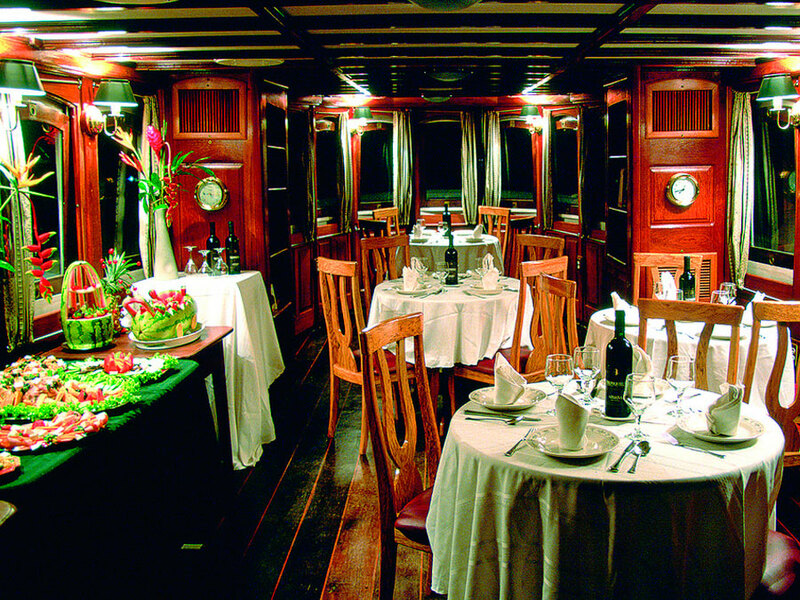 Choose a comfortable cruise or an indulgent luxury Amazon River experience with excellent service, comfortable quarters, and gourmet food to spoil yourself in this pristine wildlife-filled environment. You can have a look at our select experiences to browse Amazon tours from Iquitos or see the top Iquitos Amazon lodges. Explore the land that gave us coffee and reportedly still makes one of the world’s finest. Ethiopia has been named one of the world’s top tourist destinations of recent years. With the country’s diverse culture, a flavorful cuisine, endemic wildlife, and fascinating history, Ethiopia offers some unique and unforgettable memories. Explore some of the world’s oldest Christian churches carved straight from the rock and other UNESCO listed architecture. Then, after experiencing the food and culture, enjoy some mountain or forest lodges to head out on wildlife walks to see monkeys, hyenas, ibex, and a diversity of birds. Part of the magnificent African great lakes region, Kisoro offers great walking trails, beautiful scenery, and nothing short of spectacular wildlife sightings. This is an area of Africa where the continent is slowly splitting in two and lakes fill the void creating some impressive and beautiful scenery. Kisoro is also a base to visit the highly diverse Bwindi Impenetrable Forest, which is home to the mountain gorillas and one of the highest diversities of life in Africa. Head out on guided treks from excellent lodges to enjoy witnessing our close cousins, the gorillas, colorfully diverse birdlife, Colobus monkeys, and more. For some idea on safaris and lodges from Kisoro, you can see our recommended tours. An amalgamation of French influence and traditional Vietnamese culture, the country offers a fantastic experience of south east Asia. Home to Halong Bay, you can cruise between the many limestone islands and islets of one of Earth’s best natural wonders. Halong Bay is also a great place to enjoy beautiful limestone lagoons, bays, and caves. The country’s cuisine is delicious and influenced from the surrounding regions and colonial period to create its own flavorful range of dishes. From Vietnam, you can also enjoy luxurious cruises on the Mekong, one of the world’s great rivers. With beautiful scenery throughout Vietnam, friendly locals, and both interesting ancient and recent historical sites, right through to delicious cuisine, this is sure to become a favorite area in southeast Asia. For some cruise ideas in Vietnam, you can have a look at our recommended tours. A small tropically elegant town in northern Queensland, Australia, Port Douglas is a base to the nearby Daintree National Park, the jewel in the crown of Australia’s tropical north. Not just a Daintree gateway, Port Douglas provides its own relaxed environment with excellent restaurants, bars, and hotels. The Daintree National Park then contains some of the world’s finest rainforest lodges to enjoy guided Daintree tours for wildlife viewing. Enjoy boating on the Daintree River to see many colorful birds, large and bright butterflies, imposing saltwater crocodiles, and more. Santa Marta is the oldest city in Colombia and sits on the Caribbean Coast. The small city center is a great place to feel the Caribbean vibe and to enjoy Tayrona National Park and tropical beaches. The small alleys allow the imagination to wander as you picture this place when pirates patrolled the streets and gallions dotted the coastline. The city is a base for the nearby Tayrona National Park, which provides fantastic coastal rainforest with incredible scenery and superb tropical beaches. Choose to visit for the day or plan on a couple of nights sleeping on the beaches, nearby hotels, or in the beautiful beachside ecohabs. Rio is a beautiful city home to a lively ambiance with access to very beautiful beaches. Fringed with a fantastic mountain range providing gorgeous views from some of the city’s great hotels, the shoreline is then dotted with many different small tropical islands. While walking the streets, you’re sure to hear music and see dancing with the iconic street parties. Rio is also home to great greenery where you can see colorful birds. You can also access the Atlantic Forest from Rio and enjoy guided tours through this highly threatened yet spectacularly diverse tropical forest. Although there are other excellent gateways for a lodge-based Amazon Rainforest adventure, such as Iquitos in Peru or Alta Floresta and Manaus in Brazil, Puerto Maldonado in Peru’s south provides the highest concentration of large clay licks. 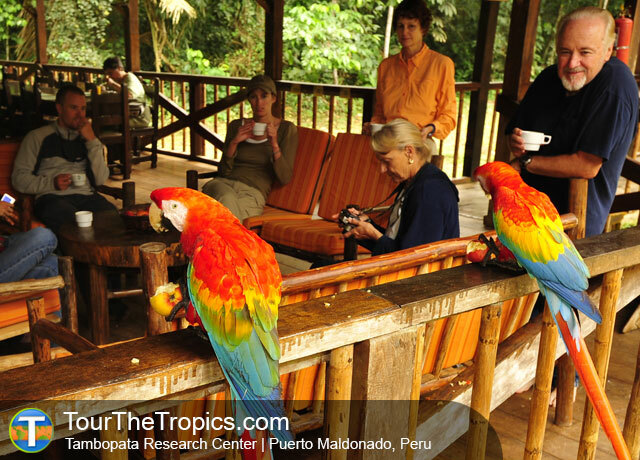 You can explore the surrounding Amazon Rainforest from the top Puerto maldonado jungle lodges. From these, you can see large and colorful macaw parrots, have the highest sightings of tapir, and get better chances of spotting more elusive wildlife like jaguar. Explore the protected areas of Manu National Park and Tambopata National Reserve for incredible wildlife from excellent Amazon Rainforest lodges. Head out with your Amazon guide to spot many different monkeys, macaws, giant river otters, tapir, toucans, fascinating plants, and hopefully sightings of rarer animals. In addition to wildlife, enjoy learning about local communities and seeing beautiful rainforest scenery in the world’s largest container of wild animals and plants. You can see our select experiences on the Puerto Maldonado Travel Guide. Kakadu is an outstanding national park in Australia’s north for incredible wildlife experiences, archeological sites, and beautiful Australian scenery. Aborigines have lived in Kakadu continually for around 40,000 years and you can enjoy Aboriginal guided treks to learn about the region from the people who know it best. Enjoy various river cruises and walks in the park to see many of the 300 or so bird species, reptiles including large crocodiles, and iconic Australian mammals. In addition to the outstanding wildlife, visit the ancient cave paintings, enjoy incredible scenery, and see the many attractive waterfalls. Regarded by early explorers as the most beautiful lake in the world, Lake Atitlan sits in northern Guatemala and is filled with glistening blue waters scenically backdropped by volcanoes. Enjoy lake boat trips, walks in the surrounding forests to see interesting wildlife, incredible views, and excellent lakeside accommodation. The locals in the villages around the lake still wear traditional Mayan clothing and hold to traditions. Step back in time, sit with a cocktail overlooking the lake and soak in the incredible view. For some ideas on where to stay for tours, you can have a look at our suggestions for lodges in Guatemala. Famous among nature lovers worldwide, the Galapagos is a series of islands off the coast of Ecuador to enjoy an impressive diversity of endemic and unusual animals. Enjoy spotting marine iguanas, blue footed boobies, sea lions, giant tortoises, and many different birds. Choose to snorkel or dive the area to enjoy colorfully interesting fish, hammerhead sharks, manta rays and more. Enjoy guided cruises and walks around the islands to learn about its fascinating history and incredible diversity of weird and wonderful animals. For some recommended tours, you can see the Galapagos Islands tours page. Sharing the famous Maasai Mara savannah with Kenya, here the continuous area receives a lower concentration of tourists and becomes the Serengeti National Park. At certain months of the year, you can enjoy the famous wildebeest migration to see millions of wildebeest, gazelle, and zebra congregating the plains. Tanzania then offers great sightings of elephants, giraffes, and big cats. Offering these iconic African wildlife spectacles, you can enjoy many national parks, such as Amboseli National Park with a beautiful backdrop of Mount Kilimanjaro, diving or snorkeling the coral reefs near Zanzibar, and see chimpanzees in Tanzania’s western rainforest. A culturally mysterious area, the UNESCO listed Easter Island is a place unlike any other and one of the world’s most remote islands. See the famous giant stone statues of warring tribes and learn why and where they perished. Some of these statues or ‘Moai’ have only recently been excavated to reveal detailed bodies below their buried giant heads. Enjoy the small and beautiful beaches, volcanoes, lagoons, and fascinating cultural history. The Moai stand proud on their island as if to symbolise the power and prosperity of their now missing clans – a warning of what’s to come if we repeat the same environmental errors and invasive introductions. A travel blogger who visited Easter Island is Andy from Andystravelblog.com. Less well known than the Amazon Rainforest, the Pantanal is the world’s largest contiguous freshwater wetland with the majority laying over Brazil, but also crossing Paraguay and Bolivia. Home to an incredible diversity of wildlife, including many species harder to spot in the Amazon, such as jaguar, anaconda, and capybara, the Pantanal offers nature lovers with an incredible experience and memories. Tour the savannahs to spot colorful birds, including giant, bright blue hyacinth macaws, vast herds of giant rodents called capybara, the highest density of caiman crocodilians, and the world’s best chance of spotting wild jaguar. The northern Pantanal is accessed from the gateway city of Cuiabá in Brazil’s Matto Grosso state. For some ideas on what to do in the Pantanal, you can have a look at our suggestions for inclusive tours. Brushing against the tropics, this is Africa’s main safari destination and base for the world famous Kruger National Park. This protected area covers a vast and diverse expanse of land protecting many iconic African animals, including Africa’s big 5. Enjoy the highest density of African elephants in a protected area, as well as many rhinos, giraffes, lions, cheetah, hippo, and other favorites. Not just a great place for a safari, compliment the experience by enjoying the sunny beaches, great wine country, and historically important sites. Tread the same ground trodden by Mandela or Ghandi, the sites of the Zulu wars, or explore further back in time to see where the fossils of our early primate ancestors were discovered. Despite some appearances, Sao Paulo is one of the world’s largest and most exciting cities. Find fantastic hotels, bars, restaurants, theatres, entertainment and nightlife. Among the modern skyscrapers, find beautiful architecture in the colonial buildings for a glimpse back in time to the city’s more humble beginnings. Filled with gourmet restaurants, find a diversity of flavors fuelled by a diversity of cultures to please many a foodie. For a break from the hustle and bustle, enjoy a trip to the Atlantic Forest, one of the world’s most threatened and diverse ecosystems. Crossed by the first Brazilian settlers, the Atlantic Forest is home to different monkeys, jaguar, orchids, fascinating plants, and many colorful and endemic birds. You can reach the forest just 30 minutes drive from the city. Possibly the most famous area for a tropical rainforest getaway, Costa Rica continues to astound tourists with its fantastic tropical beaches and rainforest. Enjoy rainforest and beach lodges for walks to spot different animals and plants or lay on white sand beaches admiring ocean views. In addition to land living life, you can explore the oceans to enjoy whale and dolphin watching or the beaches to catch sight of different turtles. 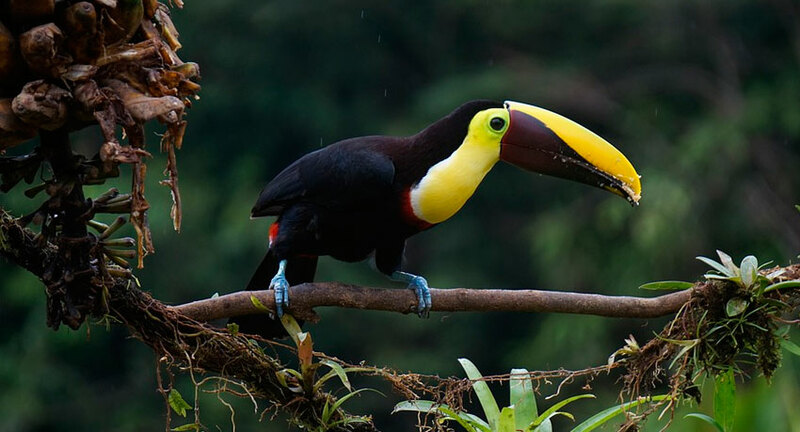 The tropical Costa Rican rainforest is then home to various monkeys, toucans, parrots, jaguar, and fascinating colorful frogs. The famous Maasai Mara has been drawing tourists for many years to enjoy the wildebeest migration where millions of wildebeest, gazelle and zebra circulate the plains in search of the greenest grasslands. Not simply a location for the migration, the Maasai Mara is home to wildlife that never leave, such as one of the highest concentrations of big cats, elephants, rhino, giraffes, hippos, and crocodiles. It makes a great destination year round to enjoy environmentally and wildlife conscious safari camps. In addition to the Maasai Mara, combine the experience with a visit to Lake Victoria to enjoy a relaxing lake-focussed experience. 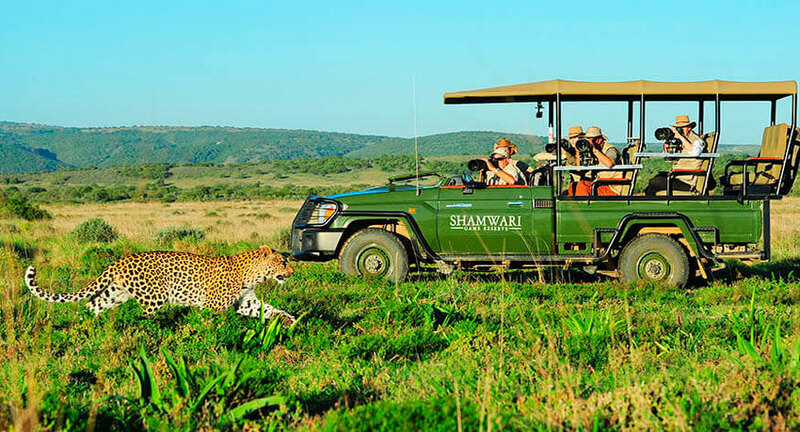 For some ideas on where to stay, you can see our recommended safaris for visiting Kenya’s Maasai Mara here. With orchids and beautiful flowers everywhere, Chiang Mai is where many Thai nationals visit for a relaxed getaway. The central ‘old city’ was built in 1200 BC and walled to protect against the Mongols in the north. Enjoy visiting the abundant temples, surrounding national parks, caring for elephants at elephant sanctuaries, and enjoying flavorful Thai food. Chiang Mai is also home a variety of international restaurants due to its expat communities and you can find excellent Indian, Korean, European, American, and Italian cuisine. India is an incredibly distinct country to visit with delicious food, ornate architecture, vibrant culture, and diverse animals and plants. India also has some excellent wildlife lodges. See fascinating and iconic animals in the tiger reserves, such as Saptura Tiger Reserve (accessed from Bhopal), which were set up to help protect these elegant and magnificent large cats. Enjoy spotting a range of wildlife on guided safaris with chance sightings of tigers and higher probabilities of spotting leopards, sloth bears, Indian gaur, hornbills and a diversity of birdlife. Explore the reserve on jeep expeditions, forest walks, and elephant safaris to experience not just the wildlife but the spectacular scenery and culture. Growing as one of Indonesia’s next big destinations, giant dinosaur-like lizards roam these Indonesian islands as a real life jurassic park. Komodo dragons are only found in this area and reach 130 kg growing to three meters long. These are the world’s heaviest lizards and a dominant predator where they are found, hunting pigs, large buffalo, and deer. Enjoy tours to see the dragons for a glimpse into prehistory and some amazing animals we’re sharing the planet with. Flores island was then the location of one of the most recent finds of human ancestry, the small hobbit man. Not just home to these fascinating animals and fossils, the islands provide great beaches, traditional villages, and mountainous scenery. Some travel bloggers who visited Flores and Komodo National Park are The Nomadic Boys from Nomadicboys.com offering a gay friendly guide. Home to some of the best islands and beaches in Thailand, Phuket is gifted with great cuisine, spa sessions, artworks, deep sea diving and some of the country’s best high end luxuries. Phuket is also home to some great protected areas to get close to nature, such as Sirinat National Park and Khao Phra Thaew reserve. Here you can find secluded limestone carved lagoons and mystical forests. Enjoy boutique shops in the old town, intricately designed temples, and great variety of entertaining shows. Some travel bloggers who explored Phuket are Alyona from Alyonatravels.com and Victoria from Pommietravels.com. Lined with amazing beaches, the Philippines contains over 7,000 islands and provides a great relaxing tropical escape. Enjoy snorkeling or diving the reefs and marine parks, trekking up a volcano, seeing the rice terraces, visiting the sand dunes, visiting fascinating tribal villages, and walking through tropical rainforests. Because of its geography, the Philippines is especially popular with divers and is sure to provide a great talking point. As an additional bonus, the Philippines has one of the world’s highest populations of English speakers and is more untouched by tourists and infrastructure than some of the other great tropical escapes. Botswana is a land locked and stable African country with a great deal to offer. Sharing the incredible animals and bird life of the more frequently visited African countries, such as lions, leopards, giraffes, hippo, elephants, and rhino, 40% of Botswana is protected for wildlife. This makes it the destination to choose if you love nature, incredible scenery and more exclusivity without the crowds of the bigger names in Africa. Although prices are on average higher than the more popular countries, Botswana ranks as one of the best places for a true ecotourism adventure and to explore a wilder side of Africa. The cultural and historical capital of Java, Yogyakarta provides fascinating temples and a mix of both Hindu and Buddhist culture and of course classic Javan food and flavors. Home to the largest Hindu temple architecture in Southeast Asia, Prambanan is an incredible UNESCO listed site to witness in person and close to Yogyakarta city. Hike the Mount Merapi volcano, enjoy great and unique food, and visit the incredible temples. Mentioned by Marco Polo as the finest island of its size in the world, Sri Lanka is the “pearl of the Indian Ocean.” At the southern tip of India, the island sits with its own take on the country’s culture and food, which ranks as one of the best in the world. The impressive palm fringed coastline contains the fascinating island where you can find fantastic wildlife and diverse culture, including many different temples. Although a small island, Sri Lanka contains one of the highest levels of endemism, with many animals and plants found nowhere else on Earth. A beautiful city on Colombia’s Caribbean Coast, Cartagena’s central streets are lined with colonial style buildings and romantic old-fashioned alleyways. The large intricately designed cathedrals foot the many different plazas in the UNESCO recognised old town. From here, the city extends into the hustle and bustle of a large South American city. With modern coffee shops, excellent restaurants, and the enigmatic draw of the old town of an afternoon or evening, the city is a must visit for travelers to Colombia or the Caribbean. As a port city, this is an obvious port of call for Caribbean Cruises that tour the islands. Cartagena is also a great combination city for exploring more of Colombia, the Caribbean, or even Central America. A travel blogger who visited Cartagena is Camille from Thisamericangirl.com. An attractive city and hub for Asia, enjoy delicious food at some great restaurants, a lively culture, coffees, colorful streets, and of course shopping. Shopping in Singapore is the national pastime and there are incredible modern shopping centers throughout. Not just a great city destination, after a short trip you can be in steamy jungle with monkeys or fascinating wetlands. The city also boasts some impressive botanical gardens for a nature fix in the city itself. The diversity is one of Singapore’s draws with food and streets inspired by China, India, and Indonesia among others. An attractive riverside city and the capital of Queensland, Australia, Brisbane is lively and moderm with great shopping, restaurants, coffee shops, and things to do. Explore the different museums, indulge your artistic interests, and walk some of the best city parks we have seen. Explore the city itself before or after a visit to the tropical north and enjoy cruises on the Brisbane River or nearby tours to see whales, turtles and dolphins. An attractive city by day, the city’s ambience and especially the areas by the river are best enjoyed at night. A starting point for Papua on the island of New Guinea, enjoy the traditional tribes iconic to the island and their mysterious ceremonies. Surrounded by mountains, the culture has remained the same for hundreds of years and the landscape has protected the wildlife. One of the world’s most interesting tribal places, the Baliem Valley also provides access to the UNESCO listed Lorentz National Park with its high diversity and beautiful scenery. Enjoy one of the world’s most culturally interesting areas, see a 400 year old mummy, and learn about this incredibly diverse island, which is home to the world’s third largest rainforest after the Amazon and Congo. A beautiful island in the South Pacific, Samoa is a great place for a tropical island getaway to relax on exquisite beaches, snorkel or dive the coast to enjoy an incredible diversity of fish and marine life, or for tropical walks in the island’s interior. The warm waters around the island gently deepen and are crystal clear, which makes it the perfect place for a paddle in the welcoming water. Explore beautiful and isolated lagoons and lava fields and explore the villages dotted with colorful flowers. The locals of Samoa are particularly friendly and are often smiling with their relaxed island-life personalities. Dubai is now on the must-visit list for many people due to its incredible architectural feats and world class luxury hotels. This is a desert area transformed, with great restaurants, fantastic nightlife, and must visit shopping destinations. The cuisine is influenced by a diverse array of cultures and flavors. The city is home to the world’s tallest and most luxurious buildings, the Arabian architecture of ‘Old Dubai’, a 10-million litre aquarium, and incredible malls. The world’s third largest island, Borneo has attracted adventurers and filmmakers for years. The island is home to fantastic diversity and a high proportion of world species live here, including orangutans, the Sumatran rhino, the Bornean pygmy elephant, macaques, hornbills, proboscis monkeys, and many many more. 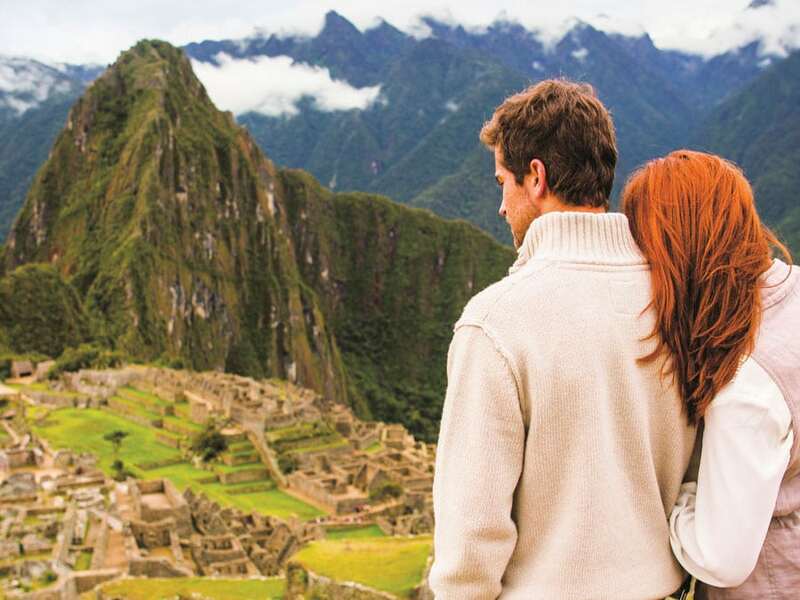 Enjoy the interesting culture, bustling markets, and dense rainforest. In addition to the wildlife, markets, and rainforests, enjoy cultural tours to villages of ex-headhunter tribes, fantastic cave systems and rainforest lodges. An archipelago of around 300 islands, Fiji as you can imagine is a fantastic tropical island getaway. Relax on the sands of palm-lined beaches, enjoy rainforest walks, diving to see colorful fish and marine life, and many island activities. Home to high quality resorts, Fiji is a great destination for an escape from everyday life. Enjoy the many fantastic tropical beaches, snorkelling the wildlife filled coastline, rainforest walks on the islands to see different birds, and cultural visits to Fijian villages. A little closer to home for many people, the Florida Keys hold its own for a fantastic tropical vacation. Enjoy the USA’s caribbean with great snorkeling, beaches, sailing, tours, and all round relaxation. With so many things to do, enjoy a break full of exciting activities or simply dedicate your days to a relaxed vacation on the beaches, everglades and protected areas. The keys are just a little south of Miami, which in itself is a fantastic place to visit. Miami offers great restaurants, lively nightlife, different museums, and of course access to the Florida Keys. Mexico has emerged as a great place to visit, with fantastic rainforests, beautiful beaches, incredible Aztec and Mayan ruins, great city life with great culture, and astounding wildlife. Already a popular travel destination for US residents, explore the many UNESCO World Heritage Sites and enjoy the Spanish influenced culture and cuisine. Stay in incredible rainforest lodges and world class resorts then visit a few of the colorful small towns and colonial styled cities, such as Guanajuato. Mexico City itself with its historic center has become a great tourist attraction with its many museums, art galleries, and attractions. Still missing from the tourist radar, Taiwan has a lot to offer and remains strangely unexplored by western travelers. Taiwan is a large island southeast of China where you can enjoy fantastic cuisine and cultural influence from Japan and China. Find beautiful temples, mountainous scenery, friendly locals, interesting markets, beautiful offshore islands, many different resorts and explore the eight diverse national parks for fantastic hiking trails. Taiwan offers great cuisine with a diverse menu of Chinese dishes and local delicacies. Ghana is a fantastically diverse tropical country in west Africa. A secure, democratic, and English speaking country on the continent, Ghana makes a great introduction to Africa. Enjoy visiting the traditional villages, relaxing on the beaches, seeing the colorful festivals, or reflecting on Africa’s dark past with a visit the giant UNESCO listed slave-trading forts. Ghana is also home to fantastic wildlife found in the various protected areas, such as Mole National Park to see different monkeys, elephants, hippos, crocodiles, antelopes and a diversity of interesting birds. A white-sand filled island chain in the Caribbean, the Virgin Islands are a popular tourist destination for a relaxing stress-free vacation. Explore the Virgin Islands National Park for excellent hiking trails, colorful and diverse birdlife, and tropical scenery. Walk the different towns to enjoy colonial architecture, cafes, galleries, restaurants, and gift shops. While snorkeling around the islands, you can also chance upon turtles swimming along the coast or head out on tours and cruises to watch dolphins and whales. Home to many different mysteries and a very high number of strange and unique wildlife found nowhere else on Earth, Madagascar is a must visit destination for anyone interested in culture, wildlife and tropical areas. Enjoy seeing the famous bouncing lemurs, different chameleons, fascinating endemic plants, and many different colorful birds. Hike the six different UNESCO listed protected areas to enjoy incredible scenery, cruising the island and its beaches, and boating the riverways. Explore incredible dive sites, deserts, rainforests, and its famous and highly diverse animals and plants. We won’t argue with Mark Twain who once said,“You gather the idea that Mauritius was made first and then heaven, and that heaven was copied after Mauritius.” Mauritius is indeed the epitome of a tropical paradise. A haven for celebrities and vacation goers in the know, the island offers a beautiful backdrop of volcanoes, incredible scenery, and some of the world’s most idyllic beaches. Enjoy different activities, such as water sports and great walks, viewing beautiful waterfalls, or simply relax on your tropical island paradise. A beautiful Central American country, the Mayan civilization crossed Belize and left many temples hidden in the country’s jungles. This is a great place to have an Indian Jones-like experience as you emerge from the forest to incredible ancient ruins. Not just a place to enjoy the incredible history and rainforest, Belize is also on the coast to enjoy fantastic tropical beaches, a wildlife-rich reef, and tropical islands. 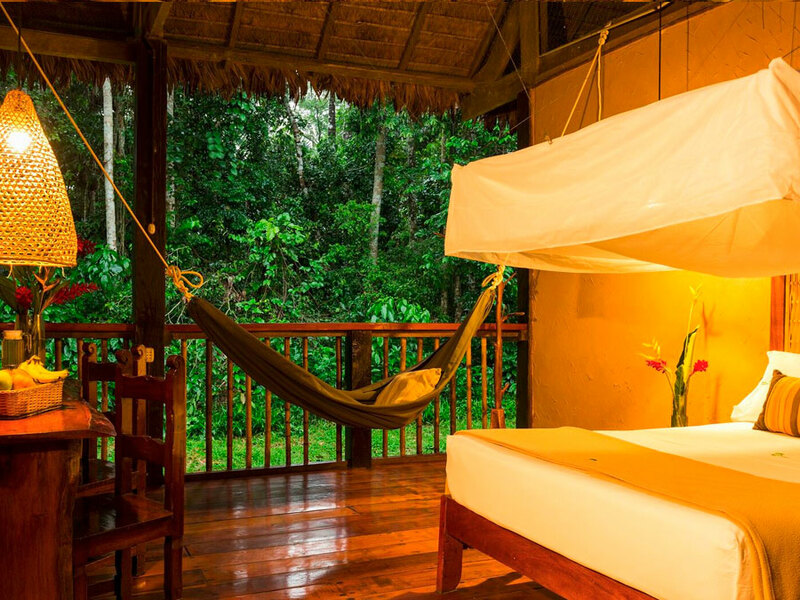 With very comfortable lodges, enjoy adventure stays, explore the astounding rainforest wildlife, marvel at the ancient ruins, or simply relax on a tropical getaway. Perhaps the most famous tropical island, enjoy seeing molten magma flows still forming the landmass and pouring into the sea. Filled with diverse environments from the desert, to the rainforest, walk island trails from day hikes to multi-day adventures to spot different wildlife and beautiful scenery. Enjoy snorkeling in different coves to reveal an impressive diversity of colorful fish, explore the national park, see lava fields, and even enjoy the cloud forest. A slower pace than the busy cities of Mumbai and New Delhi, Kerala offers a more relaxing experience of India with rice paddies and beautiful scenery everywhere. Known as the ‘Land of Spices’, as this was a spice trading region, the food is full flavored and offers some fantastic regional dishes. Enjoy a backdrop of the Western Ghats, take a relaxing cruise on the riverways, explore the Hindu temples, and enjoy delicious cuisine. The area has some great wildlife sightings with wild elephants and the occasional tiger seen. Rwanda offers some outstanding beauty, culture, and wildlife sightings, from the gorillas in the misty mountains of Volcanoes National Park, to the chimpanzees in lowland jungle of Nyungwe Forest. Long since emerging from a troubled past, the country has a thriving tourism industry with luxurious rainforest lodges and mountain bases to enjoy both the chimpanzees and gorillas. Many experts feel that the gorillas have been saved from extinction because of tourism. Even the capital city of Kigali is worth a couple of days to enjoy the calm atmosphere, good restaurants and well designed museums. For some ideas on lodges for both gorillas and chimpanzees, you can see our recommended tours. Jaipur offers a very interesting Indian experience with astoundingly intricate architecture and many Hindu temples. With all types of transport you can imagine, from camels, through cars, to rickshaws, the streets provide a look at chaotic and busy India at its finest. Enjoy exploring the fantastic buildings, such as the City Palace, Jal Mahal, and Amber Fort, visit different temples and museums, see the gardens, and enjoy the markets for a range of interesting items. This being India, you’re then in for a treat with delicious cuisine and one of the richest in the country. Located further out than the Caribbean with a milder climate, Bermuda offers a beautiful island with a lot of things to see and do. Enjoy quaint villages, friendly locals, and beautiful blue water. Hidden wrecks dot the coastline for divers or snorkelers, see beautiful caves, and enjoy walks through the protected areas. The island is also home to a great aquarium and botanical garden. Enjoy the English stone buildings with colorful paintwork, cobblestone streets, many UNESCO listed sites, and relaxing on the pink sand beaches. We recommend a government travel warning website to check updated safety information for your destination of choice, such as SmartTraveller, Uk Foreign Travel Advice, or the US International Travel Alerts and Warnings site. The Sanbona or Shamwari Wildlife Reserve?